« There’s a big difference between “lost wages” and “deferred pay”! Federal employees are starting to feel the strain of the shutdown. I am one of them. But for the sake of our nation, I hope it lasts a very long time. Roughly 15% of the employees around me are exceptional patriots serving their country. But over 80 percent feel no pressure to produce results. Why would they? We can’t fire them. They avoid attention, plan their weekend, schedule vacation, their second job, their next position. Due to the lack of funding, many federal agencies are now operating more effectively … with only select essential personnel executing important tasks. We do not want most employees to return, because we are working better without them. My advice for the president’s next move at shuttered government agencies: lock the doors, sell the furniture, and cut them down. 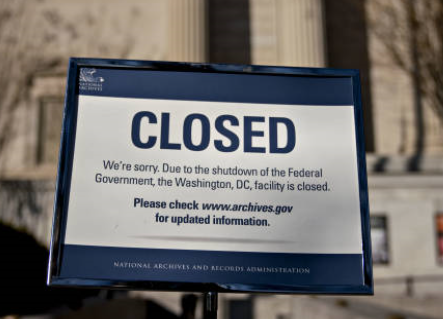 When this unplanned shutdown is over, why not “temporarily” shut down parts of the government on a rolling basis … then see what happens. Perhaps, such a strategy may flush out the lack of value delivered by many government agencies and personnel. P.S. My pick: Start with the Dept. of Education … which over decades has cost billions of dollars presiding over America’s declining education system. Shut it down for awhile and see what happens. My bet: nothing. This entry was posted on January 17, 2019 at 6:57 am and is filed under Gov't Waste & Inefficiency, Government Employees, Government shutdown. You can follow any responses to this entry through the RSS 2.0 feed. You can leave a response, or trackback from your own site. I’m only concerned about how the shutdown affect the TSA and ATC,therefor flight transportation.